The game comes from USAopoly and is titled Captain Marvel: Secret Skrulls a card game built around the BANG! series of mechanics (via Captain Marvel News ). The game has players trying to figure out who they can trust among the other players and who is a Skrull defector, but the images also reveal a few new details. For instance, we can see what the movie looks like, and we also get another confirmation that Yon-Rogg is the movie (probably played by Jude Law). Right in the middle shows the jet that Captain Marvel and Nick Fury are flying in the trailers, which appeared to be an early prototype of the current Quinjets. That's all but confirmed since the official name of the jet on the card is the Quadjet. Typically a quinjet has five engines, so we imagine we'll have a reference to this one having state of the art tech and four engines somewhere in the movie. Who knows, maybe we'll see the precursor to the Helicarrier too. 1; assemble your allies and defeat the Skrulls. You can check out the photos of the game and the official description below. "There is a new Captain in town … and she is taking no prisoners! as your favorite MARVEL characters, including Nick Fury, Korath, or Captain Marvel herself as you decide to trust, defend your alliance and battle for victory. " " a hidden identity game where players take on the roles of their favorite Marvel characters, including Captain Marvel herself, to defend Earth in an intergalactic war against shape-shifting Skrulls in disguise. level et’s virtue. Based on the popular game mechanic of BANG! " The game comes with the following (via BigBadToyStore). 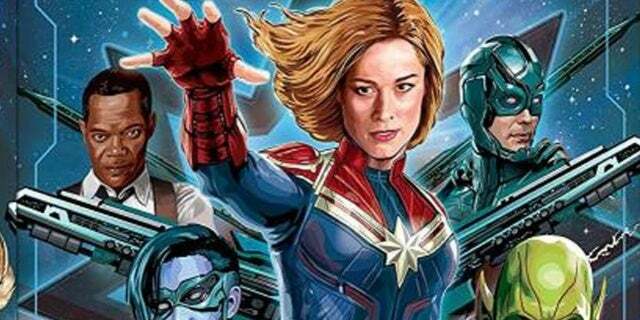 Captain Marvel: Secret Skrulls is slated to hit in the 2nd Quarter of 2019, while Captain Marvel land in theaters on March 8th.